Ab26316 recognises FPRL1/RFP transiently expressed on the cell surface of transfected BOSC cells. Chemical/ Small Molecule corresponding to Human FPRL1/RFP. Our Abpromise guarantee covers the use of ab26316 in the following tested applications. ICC/IF Use 1µg for 106 cells. Flow Cyt Use 1.2µg for 106 cells. Low affinity receptor for N-formyl-methionyl peptides, which are powerful neutrophils chemotactic factors. Binding of FMLP to the receptor causes activation of neutrophils. This response is mediated via a G-protein that activates a phosphatidylinositol-calcium second messenger system. The activation of LXA4R could result in an anti-inflammatory outcome counteracting the actions of proinflammatory signals such as LTB4 (leukotriene B4). FACS analysis of BOSC23 cells using ab26316. BOSC23 cells were transiently transfected with with an expression vector containing either FPRL1/RFP (red curve) or a control transfectant (black curve). Binding of ab26316 was detected using a PE-conjugated secondary antibody. ab26316 staining of FPRL1/RFP in CHO cells using 1µg/106 cells. CHO cells were transiently transfected with an expession vector encoding FPRL1/RFP and binding of ab26316 was visualized using a FITC-conjugated secondary antibody (green). Actin filaments are labelled with Alexa Fluor-55 Phalloidin (red). Cell nuclei are stained with DAPI (blue). Immunohistochemistry (Frozen sections) - Anti-FPRL1/RFP antibody [GM1D6] (ab26316)Image from Dakin SG et al., PLoS One. 2012;7(2):e32333. Epub 2012 Feb 22. Fig 6.; doi:10.1371/journal.pone.0032333; February 22, 2012, PLoS ONE 7(2): e32333. 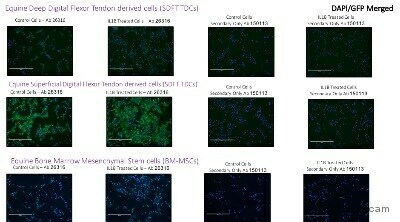 ab26316, staining FPRL1/RFP (green) in and sub-acutely injured equine superficial digital flexor tendons by Immunohistochemistry (Frozen sections). After warming cryosections at room temperature for 30 minutes, sections were rehydrated in 1% PBS-Tween 20 (PBS-T) and blocked in PBS containing 5% normal goat serum for 1 hour at room temperature. Sections were incubated with the primary antibody (1/100 in PBS + 5% normal goat serum) for 2 hours. An AlexaFluor®488-conjugated goat anti-mouse IgG was used as the secondary antibody (1/300). Publishing research using ab26316? Please let us know so that we can cite the reference in this datasheet. Inquiry: Hello, I was wondering if you could tell me what it means when it says the antibody is pre absorbed? Also can you tell me if this is compatible as a secondary for the the antibody ab26316. Antibodies are sometimes pre-adsorbed. This means they have been adsorbed with other proteins, or serum from various species, etc, to eliminate any antibody that may cross-react. The resulting purified antibody should be very pure and specific and any cross reactivity should be significantly reduced. As shown on the datasheet, the primary antibody ab26316 is a Mouse IgG1. Therefore I confirm that ab99605 is compatible with ab26316.